The Jeep inline-six 4.0 liter motor is a classic AMC design, dating all the way back to 1964 in its original form. You’d think that by 1988, all the bugs would be worked out, right? Well, not exactly. And a couple of them are rearing their ugly head in Project MJ. I sprang from the cab to see what was the matter. OK, now I’ve made the obligatory Christmas reference. Moving on. The 4.0 is not a quiet engine. Almost, but not quite, entirely unlike the NA and NB Miata, the hydraulic lifters are known to make a tapping noise. Many times at autocrosses I’ve had other drivers warn me about this noise, yet at a Miata club event, every single car is doing it. It’s completely normal, especially after it’s been driven hard. But in recent driving I’ve noticed a rhythmic tapping, connected to engine speed, getting progressively louder under the hood. When the oil light turned on and wouldn’t turn off, I shut off the engine and panicked. Fortunately this happened in my driveway, so I didn’t have to worry about getting anywhere, and I could panic in the privacy of my own home. I checked the oil and found it had plenty, which was good. But that doesn’t mean the oil is necessarily getting where it needs to go. My panic spread over to OppositeLock and Comanche Club. I got a wide variety of feedback, ranging from “it’ll be fine,” Cars and Cameras style, to “that engine is toast.” Several people suggested that one or more lifters might have failed, a common issue with this motor, but the tapping was definitely a cause for more concern. It seemed to be coming from the top of the motor, not the bottom, which meant it was likely not a rod bearing. So I decided to pull the valve cover and see what I could see. Also, it’s likely the valve cover gasket has been leaking, so since it needed replacement anyway I figured I might as well open it up now. The first thing I noticed is that one of these things is not like the other. One of the rocker arms on the #2 cylinder had rotated so far that it wasn’t even pushing the valve anymore. The rocker arm on the other valve was still in place, but loose. This means that both lifters for the #2 cylinder have failed, with a unique twist on one of them. (See what I did there?) A sharp eyed Comanche Club member pointed out that in the video he could see the #2 spark plug vibrating a bit. This led him to believe the plug might be loose, which I know isn’t true because I replaced all of the plugs myself. But despite being wrong about the cause, he was absolutely right about where the problem was. I had overlooked this hint earlier. As you can see, underneath the valve cover isn’t the cleanest place in the world, either. The oil is old and dirty, and though I have everything I need to change it, I’ve been waiting to diagnose where it’s been leaking first. 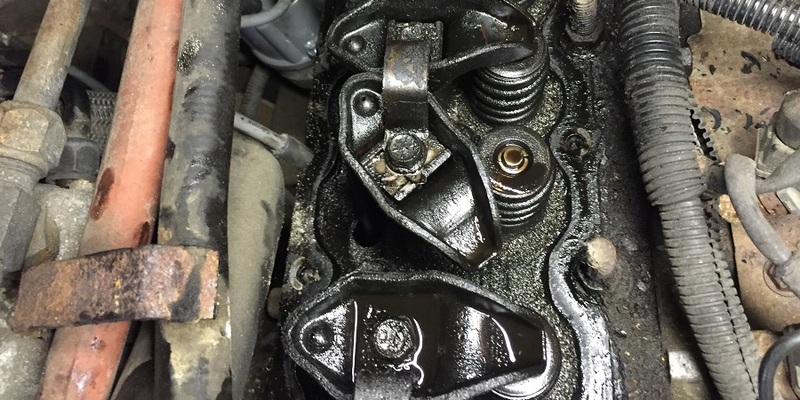 The most common place for this is the valve cover gasket, and the seepage I noticed around it as I removed the bolts leads me to believe this is the case here. So replacing this gasket will happen when I put things back together regardless. My main question right now is whether the lifters failed on their own, or whether it is a symptom of A) sludge buildup, and/or B) a failing oil pump, something else this motor is known for. Unfortunately my dashboard has the oil idiot light, not a real live oil pressure gauge, so I took a drive to the local parts stores to find a test gauge. Nobody had one. This is sad. I don’t know if it’s a cause or effect of more people not working on their own cars and/or ordering online these days. So no instant gratification for me, but thanks to Amazon Prime I’ll be able to test my oil pressure later this week. It’s quite possible that the switch has gone bad, especially considering the gunk it’s covered in at the moment. It’s conveniently located next to the oil filter, and I’ll be removing it to attach the pressure tester in its place. If the pressure is good, I’ll first try cleaning it up and reinstalling it, but if that doesn’t work they’re pretty cheap to replace. I hope this is the case. It’s an easy fix, would mean that my oil pressure is fine, and would mean no major issues besides the lifters. If oil pressure is actually low, that’s a more complicated problem, but not impossible to fix. It involves dropping the oil pan and replacing the oil pump inside – another reason to not bother changing my oil just yet, since I’ll have to drain it to do this anyway. Fortunately, from what I’ve read there’s just enough space to remove this around the front axle when the suspension is at full droop, and the new jack I just got would certainly lift it high enough to achieve this. Regardless of the oil pressure situation, it looks like I’m going to have to pull the head to replace the lifters. This is a big deal, and certainly more than I’ve ever disassembled a car engine before. But the age of this design makes it easier. I’ve watched a few videos on the job, and I think I can handle it. (How did DIY mechanics do this stuff before YouTube, anyway? The main thing I’ve learned from numerous Haynes manuals is that contrary to what they say, installation is NOT the opposite of removal.) I’ll need to clear my workbench to keep the parts organized as I remove them, but my garage came with two workbenches, so this won’t be a problem. It’ll also be a good chance to give all of these parts a good cleaning to remove any sludge that might have built up over the years, especially while the Jeep has been sitting. Unfortunately there’s no way for me to fix the motor by the time my fiancee needs it to move out of her place (basically, now), but at least that means I can take my time to do the job properly instead of trying to rush through it. The last thing I want to do is cause more problems later. I never planned to crack open the engine on Project MJ, but it looks like you’ll get to see that happen. All of the other tasks are on hold until the engine is dealt with.